Home > Preparing to Leave > Welcome to The Path Less Pedaled! Welcome to The Path Less Pedaled! Hello and thanks for joining us in our Next Big Adventure! 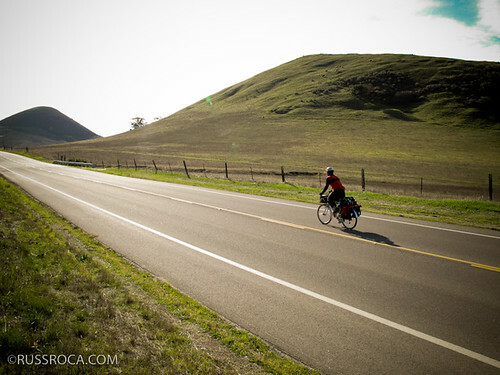 Over the past few years, Russ and I have gotten further and further into bike touring. It’s a truly beautiful way to explore the world around us and we have caught the bug for sure. As the siren song of the road gets louder, we have been heading out as often as possible – two days here, four days there – as much time as we can find. And, we’ve been delighted by all that we’ve discovered in Southern and Central California. But, each time that a trip ends and we have to come back, we wonder why. That wondering why is what has led us here. More and more, as the thing that matters the most to us is to get on the bikes and pedal away, we wonder why we own all of the stuff that’s filling up our apartment, we wonder why we’re plodding along at tasks that aren’t as fulfilling as we’d like, we wonder why we can’t just keep riding. And so we decided that it was time to quit wondering what it would be like to give up our possessions and our commitments – and actually go out and do it – give in to that little voice in each of our heads that says that there is something more for us. But, the goal of The Path Less Pedaled isn’t just for us to escape our current reality. If we have a little voice urging us to follow our dream, surely other people do as well. And we’re curious how it’s turned out for folks who have followed that impulse. What does life look like when someone chooses to live a life less ordinary, and not follow the status quo? For now, we are faced with the task of detaching ourselves from our stuff and our obligations. Which, in all honesty, is as much a part of the project as the actual ride – because it will give us the space to examine what’s most important to us and prepare us (mentally) to lead a very different lifestyle. We hope you’ll follow our journey – and the journey of the people we meet along the way. If you’d like to contribute your own story, head over to our Connect With Us page. We’d love to meet you and add you to our route. Love the idea of “A Life Without Keys” – I cycled round the world and I never thought of it like that. I like it!